Pat joined Peacock Linder Halt & Mack LLP in 2009 and is now a partner with the firm. Prior to joining the firm, he was an associate at a major international law firm, practicing corporate commercial litigation. Pat was a summer student at the City Solicitor’s Office of Thunder Bay in 2003, a researcher for the Asper Chair of International Business and Trade Law, as well as the Legal Research Institute of Manitoba in 2004. He served as law clerk for the Honourable Justice Eleanor R. Dawson at the Federal Court, the Competition Tribunal and the Court Martial Appeal Court of Canada until 2007. Pat has attended at all levels of Court in Alberta, the Federal Court, the Federal Court of Appeal, and the Tax Court of Canada. 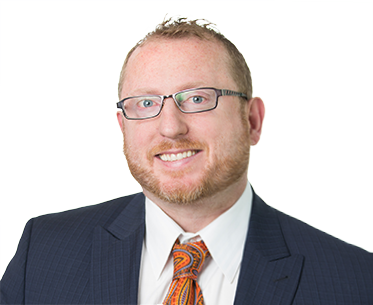 He has acted in complex matters before numerous regulatory bodies, such as the Alberta Securities Commission, IIROC, the Mutual Fund Dealers Association, the Law Society of Alberta, the Chartered Professional Accountants of Alberta and the Alberta Teacher’s Association. Prior to entering the practice of law, Pat served three years in the Canadian Armed Forces infantry. A Better Frame of Mind, co-authored with Dr. Bryan Schwartz, Underneath the Golden Boy, Volume 4, 2005 at pp. 66-91. A Sherlokian Investigation of Oliver Wendell Holmes, Trinity Law Review, Papers of Interest, 2006. Acted as counsel in setting aside a Court-ordered receivership sale process involving a multi-million dollar oil & gas asset, due to an unfair sales process implemented by the Receiver. Acted on a successful mandatory injunction, requiring the tie-in of a major oil pipeline involving public companies, and related disputes between those companies, including in successfully defending an Originating Application regarding interpretation of ownership rights of an interconnection facility. Acted on a successful 7-day, multi-million dollar trial, challenging denials of Proofs of Claims made in a CCAA process on behalf of a lender. Acted on a successful 20+ day trial involving misrepresentations regarding investments in a rock quarry. Acted on a number of trials in Tax Court confirming that solicitor-client privilege of a taxpayer cannot be waived by CRA. Acted for a public company in a leading case at the Federal Court of Appeal regarding the duty to consult Aboriginals when constructing an international pipeline. Acted as counsel on the leading judgment confirming the immunity of arbitrators in Alberta. Acted as counsel on a major Anton Pillar injunction. Obtained a $540,000 summary judgment against a private mutual fund trust and the trustee for their failure to comply with the Trust Indenture. Obtained an injunction against a general partner on behalf of limited partners regarding preservation of valuable water rights at risk of dissipation. Acted in a proxy fight to replace the Board of Directors of a public company by dissident shareholders. Acted in an oil and gas dispute regarding the removal of the operator. Acted as defence counsel in a $20 million dispute against lawyers, alleging they were involved in a conspiracy. Acted as defence counsel in allegations of fraud against suppliers of services performed for public companies. Represented directors of public companies in various class-action with allegations of back-dating stock options. Routinely acts as defence counsel to a large international retailer for personal injury and product liability matters. Assisted lead counsel in a major coalbed methane dispute. Successfully set aside a $1,000,000 summary judgment on the basis of improper service. For shareholders in private shareholder disputes, including in oppression actions. Against financial advisors for breach of fiduciary duty and failing to provide a suitable investment portfolio for their clients. In complex fraud and asset recovery actions, often with the involvement of the Alberta Securities Commission. In bankruptcy and insolvency matters, including CCAA, often in adverse positions to the Trustee, Receiver or Monitor. In dispute resolution matters, before both Judges and private arbitrators. In wrongful dismissal matters, and reviewing severance packages for terminated employees. In procedural disputes, requiring special applications for summary judgment, security for costs, amendments, compelling undertakings, and other applications to ensure litigation moves ahead fast and economically. Pat is a strong supporter of local arts, and is an annual subscriber to Calgary’s Vertigo Mystery Theatre. Pat has volunteered for Law Day, and assisted the University of Calgary in its mooting program, and from time to time has taken on pro-bono cases. In his spare time, he collects and trades rare science fiction and fantasy art, and regularly travels to art conventions. His art collection has been featured in Avenue Magazine, Amazing Stories Magazine, and on the Scifi & Fantasy Network. Parts of the collection have been shown at various art venues and events in Calgary.